In this case study, JJS Manufacturing focus on a global provider of state-of-the-art measurement equipment. The OEM designs and sells precision instruments, which contribute to a high-performance design-through-manufacturing process, allowing manufacturers to deliver premium quality products in a shorter time. Unfortunately, the OEM had been experiencing a number of quality issues with the units supplied by their existing EMS provider. Although the unit had been run through a variety of tests before shipping, approximately half of all units shipped then failed during the offsite installation stage. Between the incumbent EMS provider and the OEM’s engineering team, they struggled to resolve the on-going issue and establish the root cause. A number of obsolete component issues were thought to be contributing to some of these problems but proving out this theory had become a painful process. To overcome the obsolescence issues, the control cabinet was in the process of being redesigned. So, from an engineering perspective, the OEM saw this as an opportunity to start looking at other EMS providers. During early discussions, the OEM revealed they were looking for an EMS provider that would be able to support with their New Product Introduction (NPI) and shared their project plan and timings with us. Specifically, they wanted a partner with demonstrable experience in DfM and DfT so that a robust test strategy could be implemented from the outset. While auditing our manufacturing facility, the OEM focused on change management procedures and our document control system. They spent time challenging our quality team to fully understand our approach to root cause and failure mode effect analysis (FMEA). Also, they told us they were looking for a financially stable partner that had the technical capability, space, and resources to support their future growth plans. a new design, the OEM had designed in a large amount of material common from the previous version – minus the obsolete items, of course. A number of the bespoke items had nominated suppliers, and we were asked to inherit these by the customer in order to maintain supply chain continuity and past relationships. Drawing on previous experience, we identified that the paint finish of the custom cabinet could be susceptible to aesthetic quality issues, such as light scratches and fingerprints during handling. We raised our concerns to the customer and, following agreement, worked with them to change the paint finish to something more robust and less prone to marking. Although this change in finish helped overcome our original concerns, we found later on during the first production batches that the incoming supplier packaging was not robust enough. The cabinets were only protected by a layer of bubble wrap and cardboard corners. If the cabinets knocked against each other during transportation there was a good chance damage would occur. The bubble wrap then needed to be removed by our goods inwards inspection team, which presented further opportunities for objects to mark the paint. And of course, once this protective layer had been removed all of the painted surfaces of the cabinet were fully exposed to the manufacturing environment. Dissatisfied by the levels of protection we worked with the OEM to design a bespoke packaging solution. The bubble wrap and cardboard corner protectors were replaced with foam inserts and a double-walled cardboard sleeve, which could be lifted on and off. This sleeve covered the entire unit, and the foam inserts provided air gaps all the way around sufficient enough to cushion potential transport knocks. The most important consideration for us at the time was that any solution implemented was reusable. • Testing the main PCBA using flying probe. The back panel PCBA was considered low risk regarding possible manufacturing defects and, therefore, remained untested. • These two PCBAs are then fitted into the nineteen-inch enclosure and functionally tested in order to check the main board works, the pairing between the main board and back panel is ok, and that signals are received from the back panel. 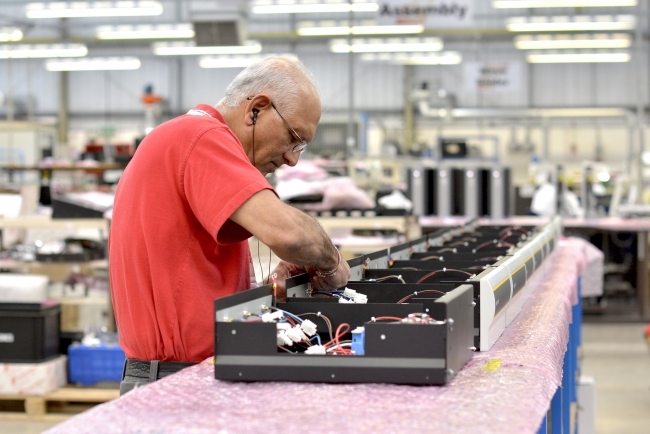 • Once this subassembly has been tested, the enclosure is then fitted into the custom cabinet along with the servo rack, cable assemblies (all continuity tested before being fitted) and power supply. • The control cabinet is then PAT tested and functionally tested. • A further functional test is then carried out afterwards to ensure the sub-assembly is connected to the servo rack and power supply and everything is working as expected. • The unit is then shipped out with a range of interface cables which have also been continuity tested. In order to proactively manage the supply chain, and deliver finished units to the OEM within the timescales and target price required, we proposed a bespoke service level agreement (SLA) and set out key milestones over an agreed period. The first stage included building and testing the first three prototypes within our UK manufacturing facility. This allowed the OEM to prove out the new design and build up confidence that previous “out-of-box” failures had been resolved. In conjunction, a material supply chain would be established to allow the OEM to call off between twenty and thirty units per month. The OEM agreed to provide us with a three-month firm rolling commitment (plus an additional six months forecasted usage), which we used to pipeline material against. The second stage would see the assembly and test of the control cabinets transition across to our Central European manufacturing. 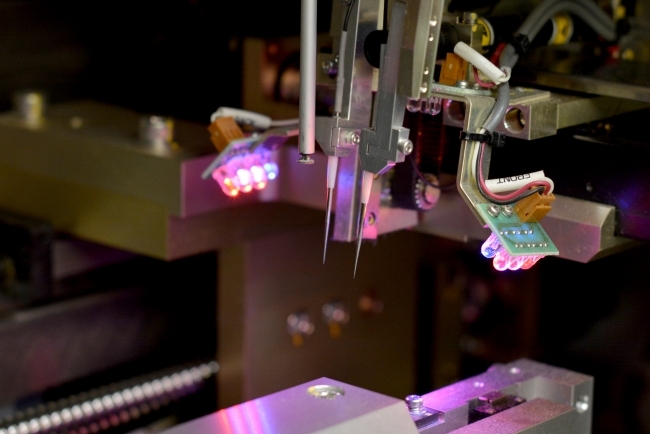 With end-user demand expected to increase up to forty to fifty units a month, this option would provide the OEM with the capacity requirements they needed in order to meet future demand.